What is Miss Piggott's Saloon area of the attraction? What is the Shanghai Kelly area of the attraction? What is the Chinatown Plague area of the attraction? What is The Ghosts of Alcatraz area of the attraction? And so your journey begins. 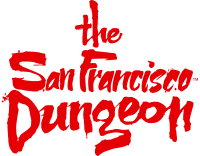 Descend into the depths of the Dungeon in an old mine shaft elevator. Don’t mind the creaking floor and rattling chains, it’s checked for safety once every 50 years. A local businessman and showman, our charming friend Jack will welcome you and prepare you for what lies ahead: 200 years of the horrible truth behind San Francisco’s authentic past. Jack does like to get up to some real mischief sometimes, but he should be on his best behavior for your arrival. Is the mine shaft elevator safe? The Descent is the perfect opening to your Dungeon experience, both funny and suspenseful.